Over 80 people showed up for the Stetson Christmas Dinner for 2015 at a new venue, the Mandarin Chinese Buffet restaurant in Orleans. A vast improvement on previous years, the dinner was excellent and the venue top-notch. Prizes were distributed to those lucky enough to hold the winning tickets and Santa arrived to give gifts to the children. Prizes were supplied by Great Hobbies, Orleans Hobbies & Sama Home Spa in Orleans. Gerry Nadon received a special award as did Marc Lanthier & Hal MacDonald and a special presentation to Dave Percy from Marc Lalonde was made. 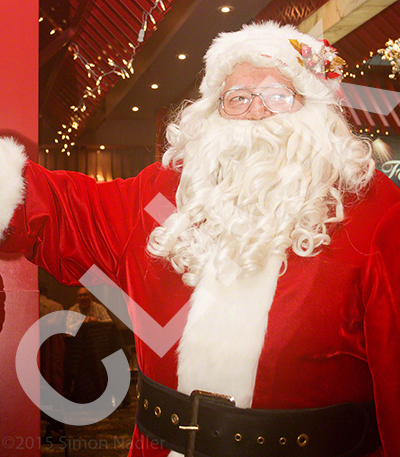 Gerry may or may not have had something to do with Santa *wink*, thanks Gerry! John Jackson made all the plaques & trophies, thanks John! All in all a fun night! Many thanks to all who attended and more so to the organizers who once again 'made it all happen'. ...has been generously created and supplied by a new member, Bob Sintzel. The panorama was created in summer of 2015 and is a great way to show off our amazing field. Now prospective members and event pilots can see what they are dealing with long before showing up at the field. Click here if your web browser supports Flash. Click here if you have Quicktime view installed. ... has been updated to include the latest version of our field for both the RealFlight and Phoenix simulators. The same new member who created the panorama above has also spent considerable time creating an up to date version of the Stetson field. Dropbox is an easy way for us to provide these files to you and it's located at the bottom of the menu on the left... see it? Simply click to open it, navigate to the brand of simulator you use and save the file to your computer. There are instructions also, don't forget them. You don't need an account or to sign up if prompted, click 'No thanks' at the bottom of the prompt to see the files. Enjoy flying at our field with the most realistic experience you can have from home... thanks again Bob! ...the annual Stetson New Students Fun Fly! 16 registered pilots including students and instructors arrived in brisk but clear weather this morning, bringing a great selection of aircraft. 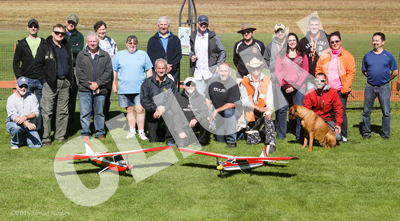 Things warmed up into a perfect day full of flying, excitement and relaxation with families and friends culminating in a BBQ lunch and prize giving. Many excellent prizes were supplied by Great Hobbies in Trainyards and greatfully accepted by the pilots... thank you very much Dave Rees! Huge thanks also to Dan and his team of volunteers without whom these events would simply not happen. ...the annual Stetson IMAC contest! 100% humidity, 22C+ degrees made for low cloud and fog for much of the morning hence the pictures of planes disappearing!. Once the wind arrived the weather cleared and the contest began. Many pilots and very large aircraft competed in several classed and the unknown sequence was flown on the Sunday. Many thanks to Dan Marcotte and all the volunteers that made today a success! ...the Scale over Ottawa Event! The weather was not cooperating this year and threw curve balls at us every day in the week leading up to the competition. Saturday arrived with fog, high humidty and threatening rain however we managed an excellent day and completed the competition in both Fun Scale and Sportsman's classes. 13 pilots competed, 18 volunteers made the day possible and 65 people in total were onsite at lunchtime. Garry Baker generously donated a large scale ARF Tiger Moth as the pilots prize and added to generous donations from Dave Rees on behalf of Great Hobbies. Thank you to all who participated, contributed and worked tirelessly to make the event a success, it simply can't happen without you. Brock took the pictures for this album and Larry's pictures are here. ...the Stetson Heli Fun Fly Event! Perfect weather arrived for the Heli Fun Fly event for 2015. There was a small turn out but many pilots brought several helicopters & drones to provide an impressive array of machinery. Palm sized drones and helicopters up to Peter Wakefield's awesome turbine powered scale beauty. Many thanks to Jim Denyer, John Stewart, Dan Marcotte and all the volunteers that made today a success! Thanks also to Fred Z from Dynamic Hobbies and Dave Rees from Great Hobbies for the prizes. Other prizes generously donated by RCFlightdeck.com. ...Canada Day at the Canada Aviation & Space Museum! 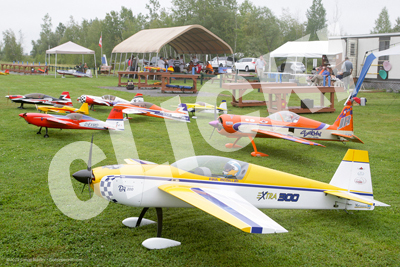 Once again, the Stetson Flyers club put on a static display at the Aviation museum for Canada day to give thanks for allowing the club the use of their facilities for our monthly meetings throughout the year. Huge thanks to all the volunteers and those who brought aircraft for display. It was a long day and due to the weather, thousands of people decended on the Museum to partake in the days activities. The Stetson club was seen by almost all who attended and the volunteers were inundated with questions all day. John Stewart setup a simulator that was a hit with young and old trying their hand at flying helicopters. 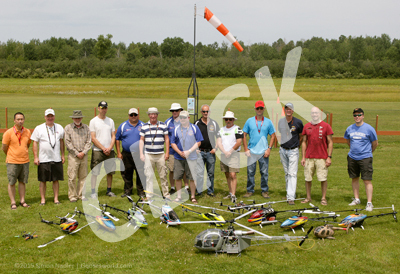 ...the Stetson Ed Rae Memorial Fun Fly event! 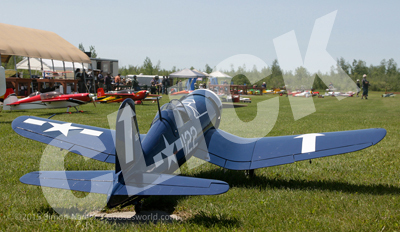 47 pilots & plenty of spectators arrived and the great weather was certainly a factor in the events success. We were visited by the MAAC president Rodger Williams and the People's Choice award went to Chris Malcomnson & his beautiful red & white Pitts biplane (see pictures). Dan led the core of 9 volunteers who covered all the key roles with enthusiasm and capability... these folks really are the 'make or break' of our events... Thank you! 11 prizes were donated by Orleans hobbies, Great Hobbies and Dynamic Hobbies. A great weekend of flying and friends! 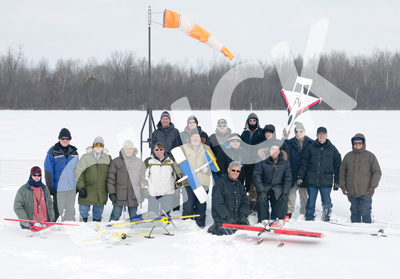 ...the Stetson Winter Fun Fly event! 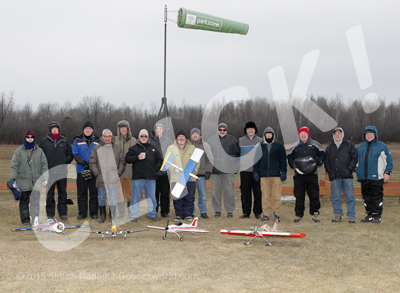 Dan and his crew of volunteers were up early to arrange the second club event of the year... the Winter Fun Fly. 23 people arrived to fly off the perfectly smooth snow and ice covered runway in balmy -8C weather with a 10kph Westerly wind. Many thanks to all that helped with the chilli lunch, it was appreciated after a couple of hours in the wind. Thanks also to McDonalds in Casselman (via Sue) whose coffee donation literally kept us alive! A great day of flying and friends after such a long winter... come on summer! ...the Stetson First Fly event! I would like to thank Dan and the crew who were up very early this morning to get things ready for our 9 AM first flight event. The heat was on and all was in order! First thing I saw as I pulled in was Hal MacDonald flying his kite! Does that count for first flight? It was great to see so many familiar faces this morning and wish everyone a happy New Year. Coffee, TimBits and a surprise bottle of bubbly (Denise's idea and insistence) from Gerry Nadon was enjoyed thoroughly by everyone. (of course the bubbly was AFTER flying). We managed to get them up at the appointed hour, and in spite of the stiff wind, everyone managed to land safely. 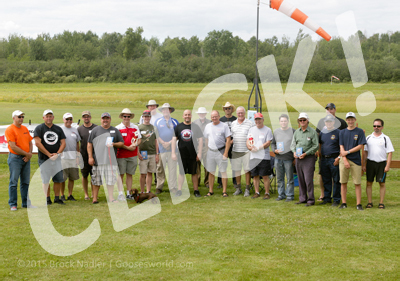 Shortly after, in the shelter, trophies were handed out for First Flight Electric (John Jackson) and First Flight Gas/Glow (and the only one...Gary Robertson). The wind kept building as we stood inside the shelter feeling it rock back and forth in the big gusts. Glad we didn't have to go up in that! Once and done, except for our intrepid Mikey, who went out and had a second, and maybe even a third flight. Wow! Dedication? or...??? We shared lots of stories and expectations for the new year ahead, and thoroughly enjoyed ourselves! I hope everyone had as much fun as we did on this New Year's morning, and I wish you all a great 2015! Many thanks to Goose, our intrepid photog, for catching those great photos again!